Cedar Bluff Reservoir - Photo by Troy Brown Panoramic views from the tall limestone bluffs on the south shore are breathtaking. Campers are often serenaded by yapping coyotes in the night. During fall and spring migrations, the lake is home to many kinds of ducks, geese, and shorebirds. Throughout the winter, Canada geese are seen on the former fish hatchery ponds located below the dam. Winter also draws bald eagles to Cedar Bluff. Look for them from the road across the dam. During summer, hawks and turkey vultures soar effortlessly for hours on thermals created by the dam. A good viewing spot is the hilltop adjoining the south end of the dam. A visit to Cedar Bluff should include a driving tour of the Cedar Bluff Wildlife Area at the western end of the reservoir. If muddy, the roads may be impassable without 4-wheel drive. Wildlife sightings can include both mule deer and white-tailed deer. Also watch for eastern cottontails, black-tailed jackrabbits, and the large stick nests of the eastern wood rats. Summer birds include black-billed magpies, rock wrens, and Bell's vireos. During winter, hawks take advantage of the rodent populations in the surrounding prairie. Watch for red-tailed hawks, ferruginous hawks, northern harriers, prairie falcons, and American kestrels. At dusk watch for long-eared owls and the moth-like flight of short-eared owls as they swoop low over the prairie searching for prey. Wild turkeys are often seen. 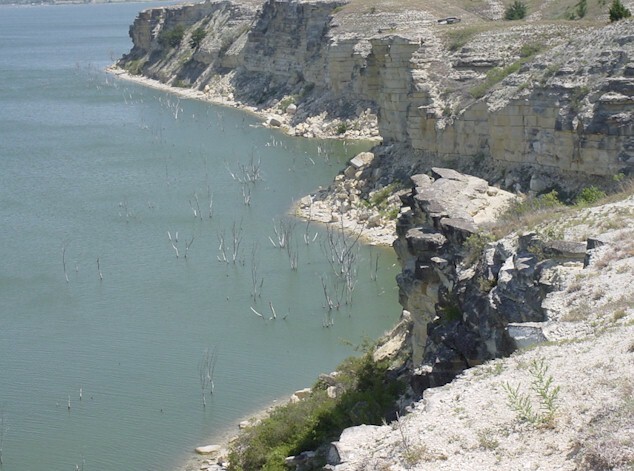 Check chalk outcrops and gravel areas around the reservoir for fossils. User fee, Water available, Restrooms, Boat Ramps, Showers, Shelter houses, Cabins. 121 utility campsites. Primitive camping allowed. 6 Cabins (make a reservation online). Click the icon to find a birding list for Trego County. Directions: From exit 135 on I-70 (25 miles west of Hays), travel 13.1 miles south on K-147 to the turnoff to the main office and campground. If you're visiting Cedar Bluff Wildlife Area, be sure to pick up a map at the office. The best parts of the wildlife area are on the southwest side of the lake. Ownership: The entities responsible for management of Cedar Bluff are below. Click here to visit the KDWPT web page for Cedar Bluff State Park. You may download the KDWPT brochure on Cedar Bluff State Park or email the Park Manager from the links at the top of that page. Get the Cedar Bluff Wildlife Area brochure here.